The only food other than pizza that I absolutely obsess over, is buffalo chicken wings. Mostly, it’s the sauce that I crave, and I will pretty much eat buffalo chicken flavored anything. I simply CANNOT resist. So at home, I love to experiment with new buffalo chicken recipes that are delicious but still Weight Watchers friendly. Recently, I whipped up some of these Buffalo Chicken Meatballs and they were truly out of this world! So easy to make, and a lot less messy than wings! Plus each 4 meatball serving was only 3 Points! I actually made these for my husband and I for dinner one night, so I made 24 large meatballs. You can make this into a low calorie mini meatball appetizer recipe by forming the meat mixture into 36-40 mini meatballs instead of 24. Serve them with toothpicks, and they will for sure be a guaranteed hit at any party! While Frank’s Red Hot Sauce is my hot sauce of choice for this Weight Watchers Recipe, feel free to use any kind you’d like, as long as it has no fat or carbs like Frank’s. If you are a fan of buffalo chicken wings, I highly recommend giving this Buffalo Chicken Meatballs Recipe a try immediately! 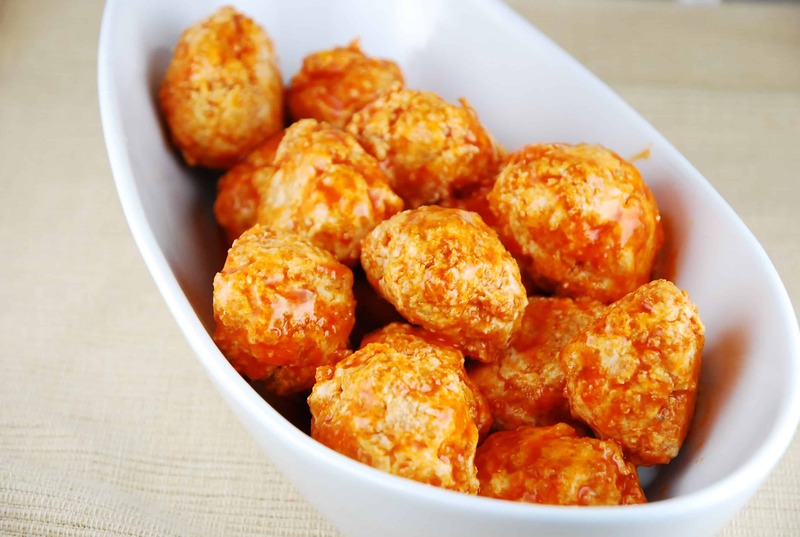 Buffalo chicken fans can rejoice in this low calorie Buffalo Chicken Meatballs that will melt in your mouth! Incredibly flavorful, easy to make, and a lot less messy than wings, these tasty meatballs are a great party food! Preheat oven to 425 degrees. Spray a 9 x 13 baking dish with cooking spray or an olive oil mister. Melt butter in a small saucepan over medium heat. Add in hot sauce, and stir until combined. Remove from heat and set aside. In a large bowl, combine all ground chicken and all remaining ingredients, along with 1/2 of the hot sauce mixture. Mix well with hands until thoroughly incorporated. Shape into about 24 1.25” meatballs, and place meatballs into the prepared baking dish. Cook in the oven until meatballs are cooked thoroughly cooked through, about 20 minutes. Remove from oven and toss with remaining hot sauce. Does the new Freestyle program change the number of SmartPoints in this recipe? Yes! I just ran this recipe through the Weight Watchers Recipe Builder and it comes out to 3 Smart Points per serving. Hi, your website is not working since you have allowed ads to be displayed. It became impossible to get to any receipes, your site was hung up on an ad for a car. Too bad you decided to add add ads. It ruined your excellent site. We made these for dinner tonight and OH MY GOSH. They are incredible! My boyfriend and I couldn’t get enough! I served them with the Warm Mushroom & Asparagus Salad also from this site, and it was an awesome dinner! At only 4 PP, if you go to the table with enough points left in the day, you’ll thank yourself that you can have seconds. I packed some for lunch this week, and I’m glad I did that before we dug in! I –highly– recommend this recipe. They were perfectly done at 20 minutes and perfectly spicy (enough to make us go, “Whoo-whee!” but not enough to send me running for the ranch dressing). I am not a blue cheese fan, but didn’t mind it at all in this recipe. I was also skeptical about there being enough sauce left over to coat the meatballs with well, but it was totally perfect. These blew my mind. I have never hada better meatball. Thank you. Mad ether exactly as written with a side of steamed broccoli and half a sweet potato. 6pts+ total. Bam! Sorry for the typos. Not sure what happened! I test drove these tonight for a party we are having on the weekend. They came out miles ahead of my expectations;) The Panko and the cheese make them out out with a beautiful crispy coating. I baked them on parchment on convection, so good and a super easy clean up 5 stars! I made these tonight with ground turkey and sweet n’ tangy wing sauce instead of hot sauce. The meatballs were amazing! I doubled the recipe and have 12 XL meatballs. I also broiled them at the end for added crispness. (about 30 mins are 425 then 3-4 mins on broil at the end). Everyone loved them! Really delicious!! I also normally don’t like blue cheese, but it was good in these! I made these, but cut the breadcrumbs down to 1/2 cup and added about 6 shredded baby carrots into the mix. Awesome! I flash froze them last Saturday and we’ve been eating them as we please. In fact I love the Siracha sauce with lots of foods! Could these be made in bulk and fozen? I made these last night and they are AWESOME! I took your serving suggestions — we had them on meatball subs for dinner and I had them straight up with celery and ranch for lunch. They have so much flavor that they’d definitely work well as an appetizer. I’ll definitely be making more. These look really interesting – would there be any significant difference if I used Ground turkey breast? Thanks. Not really much of a difference, so you can use turkey if you prefer. Made these today. Oh my goodness they are amazing. I will be making these A lot! Thank you so much. Thanks for a great recipe. What happens if I leave out the blue cheese? Is there a reduction in the fat or protein #’s? Should I substitute another cheese? Thanks for the info ahead of time. I really want this recipe to work! How hot are these on a scale of 1-5? Can you reduce the heat by reducing the sauce? I’d say they were about a 2.5. I like things REALLY spicy, so my tongue isn’t always the best judge. But yes, to make them less spicy, just use less of the hot sauce. Do you have any suggestions what to eat with them? Would these work on a wrap? Did you eat them by themselves? I ate them straight up, with celery and cucumber sticks and ranch dressing. My husband had some leftovers on a roll and made a delicious buffalo chicken meatball sub…I think you can play around with a few ideas and see what works best. But these two ways are my favorite! I have no idea why… but appetizers are always a tricky thing for me. For potlucks, I always dread that assignment – So I’m always on the lookout for quick, easy apps. Pinning this to try soon! At 4PP a serving, these would also make a great lunch… will make them soon!